Does This Design Look Familar? One of the most successful electric guitars of all time is Gibson’s Les Paul model. Since his name is associated with this legendary model, many people think that Les Paul himself was both the inventor of the electric guitar, and the designer of the Les Paul guitar. Neither of those is true. Les Paul was a very talented performer, an innovator in the field of multi-track recording and a long-time proponent of the electric guitar. But his relationship with the Gibson guitar company was as an endorser. This site is dedicated to a little known musician and inventor from Burlington, Iowa, named Orbra Wallace Appleton. 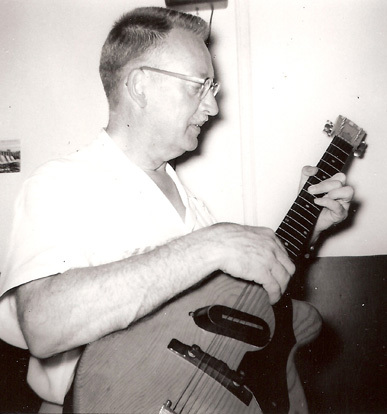 And O. W. Appleton had more to do with the design of the famous Gibson model than Les Paul himself. This is the story of the “APP” guitar. A solid-body electric guitar designed and built by O. W. Appleton in 1941, ten years before the introduction of the Gibson Les Paul. Born in 1902, O. W. Appleton (or "App" as he was known) learned to play the ukulele when he was sixteen years old. By the time he was twenty he was proficient in numerous instruments, including his favorite, the guitar. Sometime in 1925, while working at a furniture store, he took the tone arm off of an RCA radio-phonograph and attached it to his acoustic guitar. He was then able to amplify his guitar through the radio. App and the furniture store owner were so thrilled they stayed up all night playing the guitar. 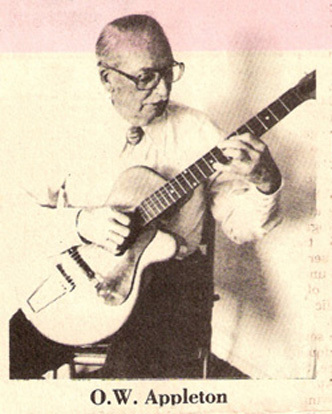 During the 1930s App tried a variety of pickups and microphones to amplify his acoustic guitar. In 1941 he came to the conclusion that the natural vibration of the top of his acoustic was detrimental to amplifying the sound of the strings. He reasoned that if he could stop the guitar's top and bridge from vibrating, he would get a better electric sound. He experimented by having his son, Jamie, hold a piece of lead against the bridge of his Gibson L-Jr. acoustic. As he suspected, this increased string vibration and sustain. He considered filling the guitar with sand, or even salt. But ultimately App decided that the logical step was to start from scratch and build a completely solid electric guitar. From a local lumberyard App purchased a plank of pine, and proceeded to carve a single cutaway, arched-top, solid-body electric guitar. App knew some folks at Gibson, and from them he bought an unfinished neck blank to use on his new instrument. He called the guitar the “APP." The APP was unlike any other electric guitar in the world. Although electric guitars existed in 1941, they were all either archtop guitars with added pickups, or small laptop Hawaiian guitars. 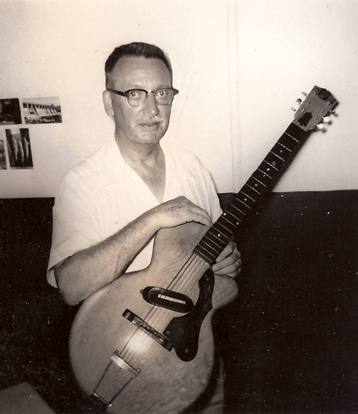 Even the guitar that Les Paul was using, "The Log," was basically an archtop guitar with a solid center section. Appleton's design was something new. And this new design foretold the future look of electric guitars! In 1943 Appleton took his guitar to Gibson, to see if they had an interest in manufacturing the model. They told him that they couldn't imagine someone playing a solid-body electric guitar. App attempted to patent his instrument, but as a musician from the small town of Burlington, Iowa, he didn't have access to a patent attorney. He sent letters and money to folks who advertised themselves as patent attorneys in the back of Popular Mechanics Magazine, but they merely took his cash. During World War II, as manufacturers dedicated their factories to the war effort, all guitar production ceased. Appleton stopped pursuing a patent. Almost ten years later, in 1952, Appleton received a letter from a friend at Gibson. The letter read, "Well, App, you see our competition (editor's note: that would be Fender) has finally forced us to come out with your solid guitar. Sure wish we had listened to you back in 1943." Included with the letter was a brochure for the new Gibson Les Paul Model. In frustration, App threw the letter out. Today, App's story is largely forgotten. And although Gibson's R&D department took credit for the design of the Les Paul Model, you have to imagine that they were influenced by a nearly identical guitar presented to them a decade earlier by O.W. "App" Appleton. Special thanks to his son, Jamie F. Appleton II.